With 40 game releases announced for this year already, it is really important that Play’n GO starts the year off right. It seems like the company decided to start big and kick off 2019 with a roar with its latest release Raging Rex. 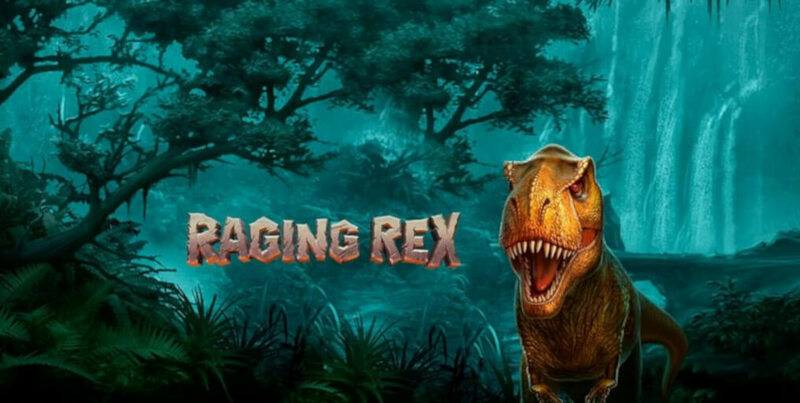 Raging Rex is a Jurassic-themed slot that offers 4,096 paylines across 6 reels. Available on all devices from $0.10 to $100 a spin, this video slot offers some eye-popping features like Raging Spins and Rampage feature. Immerse yourself in the roaring territory of the almighty Tyrannosaurus while dragonflies hover across the screen and the waterfall hums in the background. This is a visually superb, high volatility video slot that pays all ways so we hope you are thirsty for blood as ageing Rex himself. Low-value symbols are represented by six fossil insects while high-value symbols are the beautifully portrayed dinosaurs like Triceratops, Parasaurolophus, Dilophosaurus and Velociraptor which is the most valuable of all symbols, giving you 7.5x times your stake for 5 on a payline. Magnificent T-Rex is the start of the show, of course, that acts as a wild, thus replacing all other symbols bar the scatter. If T-Rex appears fully on any reel, he triggers the Rampage feature. The reels start shaking as he rewards hidden treasures when he transforms himself into the almighty Raging Rex. The feature that has the most potential is Free Spins mode and all you need to do is land at least three Meteor scatter symbols. Landing 3, 4, 5 or 6 scatters wins you 8, 15, 20 or 30 free spins respectively and if you manage to land 2 more during the feature you will trigger unlimited free spins. After some amazing successes including Banana Rock, Battle Royal, Dragon Maiden, Imperial Opera, Legacy of Egypt and Rise of Olympus, Play’n GO has to keep up the same pace so we expect many great things this year. This prehistoric adventure with 4,096 ways to win and staggering payout of 5,000 times your stake on every single spin sure promise a lot of fun. Travel back in time when dinosaurs walked the Earth and land some mega wins along the way. “2019 is a big year for us, with 40 games planned for release, it’s important to start off on the right foot and set the correct tone” Johan Törnqvist, CEO of Play’n GO believes Raging Rex is a great game for the company to start of the year.